The year 990 saw the area’s first settlement, the village of Sota-Ribes, presided over by Bell-lloc Castle. 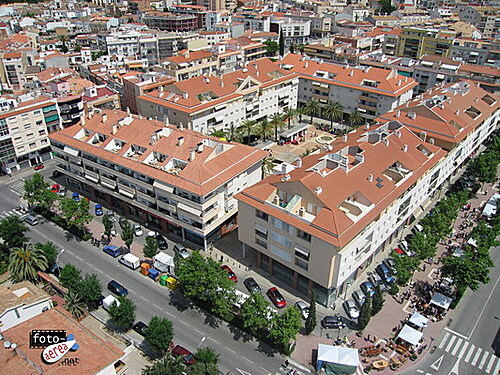 In the 14th century a new town center was founded, now called the Palou neighborhood. In time, the township grew and became transformed. In the 19th and 20th centuries, as a consequence of the great economic and social hardship, many local residents set off on a voyage to America to make their fortune. Upon returning home, they stamped the area’s rural and urban landscape with a unique architectural legacy. The town of Sant Pere de Ribes is found in the beautiful heart of the Garraf region, and the township is primarily located, with the exception of just 650 meters of coastline. The agricultural flatlands, farmhouses and barns dotting the township and inside the Garraf Park are highly important features of the landscape, not to mention the Ribes and Begues streams, which once were also paths heading inland. Sant Pere de Ribes consists of two large population centers, Ribes and Les Roquetes, and a number of historic areas such as Vilanoveta, Puigmoltó, Sota-Ribes, el Palou, and the medieval farmhouses of Les Torres. Sant Pere de Ribes has grown spectacularly since the sixties largely due to town’s own charm, its location at the gates to the Garraf Park and the great connections to other areas. The original town center, Sota-Ribes, gives the idea of what medieval Ribes was like. Formed around the old hilltop Ribes Castle, then called Bell-lloc (10th century), the highlight of which is a cylindrically-shaped defense tower. Nearby the Old Church of Sant Pere, originally built in the 12th century as a small pre-Romantic church, and its magnificent Portal de les Ànimes, or the Gateway to the Souls. It remained a place of worship until early in the 20th century. The rest of the medieval area includes the Terme House, which once held the first town hall and the local school. Another lovely sight is the Lever Bridge and the Centennial Pine, officially declared a monument.